We’re 17 days away from Christmas! Time to get going on your annual Christmas baking marathon. If you’ve never done it before, then this blog post will inspire you to put on that apron and get out your baking utensils stashed at the back of your cupboards. We both love sweets and it’s tough for us to resist tasting delicious pastries during Christmas visits to family and friends. So, to minimize our sugar intake during this Season and live with a little less guilt, we’ve ‘upgraded’ some of our old baking recipes and have also found some wonderful ones online from like-minded sweets lovers. We are going to share with you all the recipes we tried in our Christmas baking and give you some tips on how to make your baking a little healthier. With baking, we know it’s tough to completely avoid all sugar. Some recipes need specific kinds of sugars or sweeteners to ensure they bake properly. Our advice is to choose the ‘better’ kinds of sugars and reduce the amount used in the recipes. For example, use cane sugar or maple sugar instead of refined sugar. 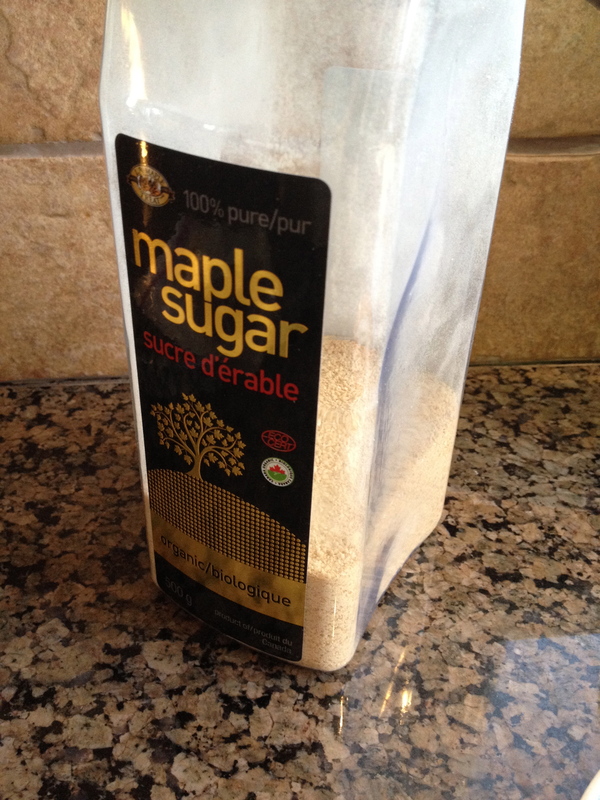 Maple sugar is sugar that is made by evaporating the sap of sugar maple trees. This kind of sugar is sweeter than white sugar so you can use much less of it when substituting for refined sugar. In some recipes, you may be able to use dried fruits, bananas, or maple syrup as substitutes for white sugar. We prefer to use maple syrup or honey over agave syrup as the agave is still refined just like white sugar (http://www.webmd.com/diet/features/the-truth-about-agave). Keep in mind, these are all sugars so reducing the amount used by a little will help your heart and waistline! Another common ingredient in Christmas baking is butter or ‘shortening’, which is high in saturated animal-based fat. 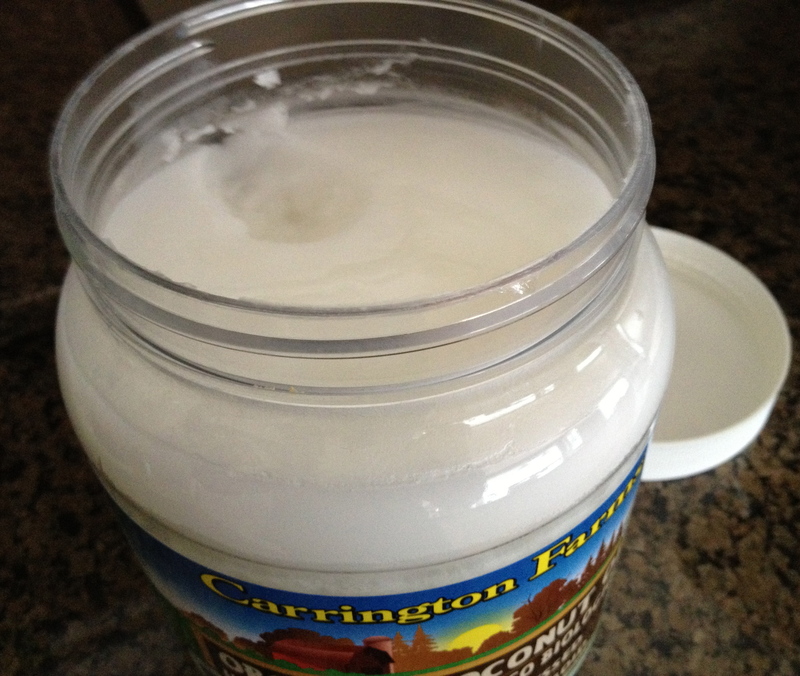 We have used coconut oil successfully in replacing butter in most of our recipes. Although coconut oil is also high in saturated fats, it contains lauric and myristic fatty acids and plant chemicals, which may offer more health benefits over butter. Coconut oil is also cholesterol free. Watch for our upcoming Monthly Food Feature on coconut oil to learn more about this product. 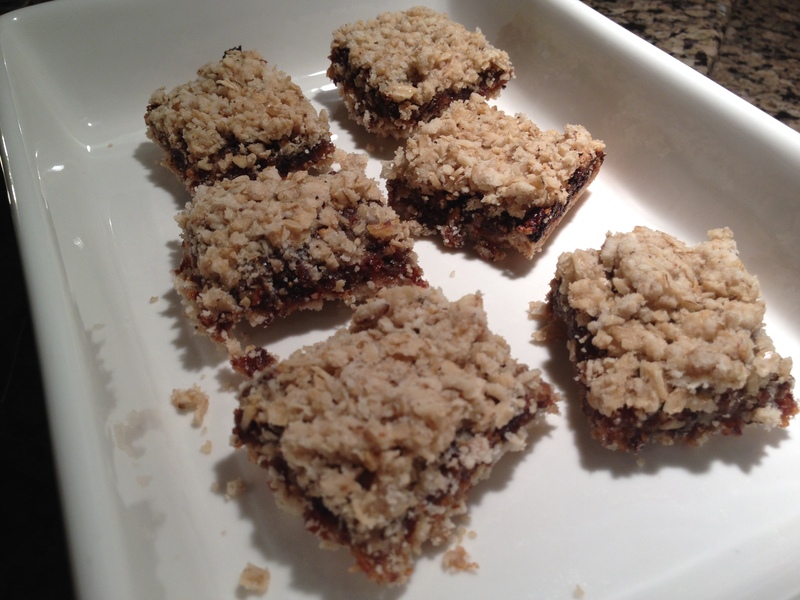 The coconut oil gives the baking the same kind of crumbly texture with little coconut flavoring coming through. Depending on how much coconut oil you use, there may be a little more oily residue on the cookies. You can also use the healthier liquid oils such as olive, grapeseed and avocado, or use these in combination with the coconut oil. Other ideas for adding moisture to your baking to replace butter include using apple sauce, mashed avocado, bananas, or pumpkin. Regardless of what type of ‘shortening’ you use, the oils listed above are all fats so keep these to a minimum without spoiling the recipe. When making replacements, you may need to test a recipe a few times! We’ve had our share of flopped recipes, which needed to be rescued (see pictures below). Link #1 – by Huffington Post, a general description of the traditional flours, the macro-nutrient content and how they are best used. Link #2 – by Jimbo’s, a California-based natural food grocer, a guide to the alternative flours, their benefits and uses. For our gluten-free friends, there are now a number of flours on the market that allows them to enjoy the sweets without worrying about GI issues. Most of these are listed in Jimbo’s Guide. 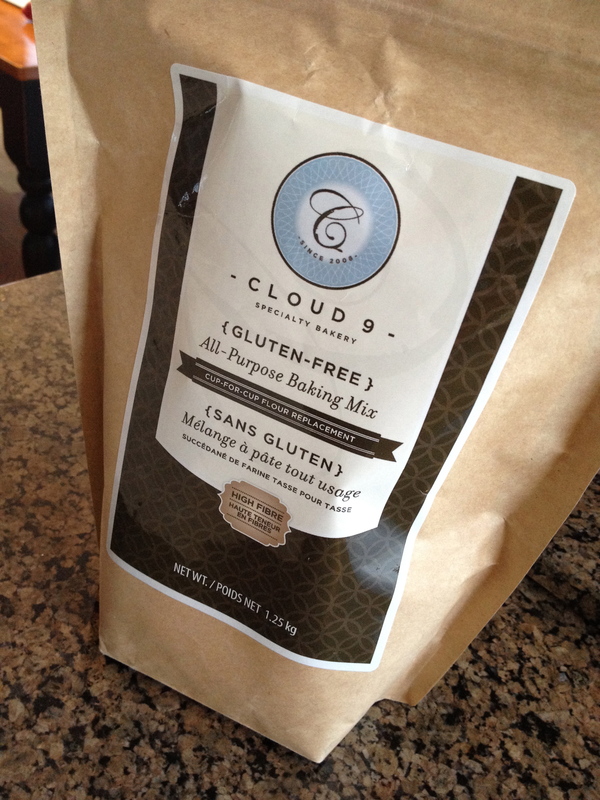 We also found a packaged gluten-free baking mix called Cloud 9 at Costco that we liked. 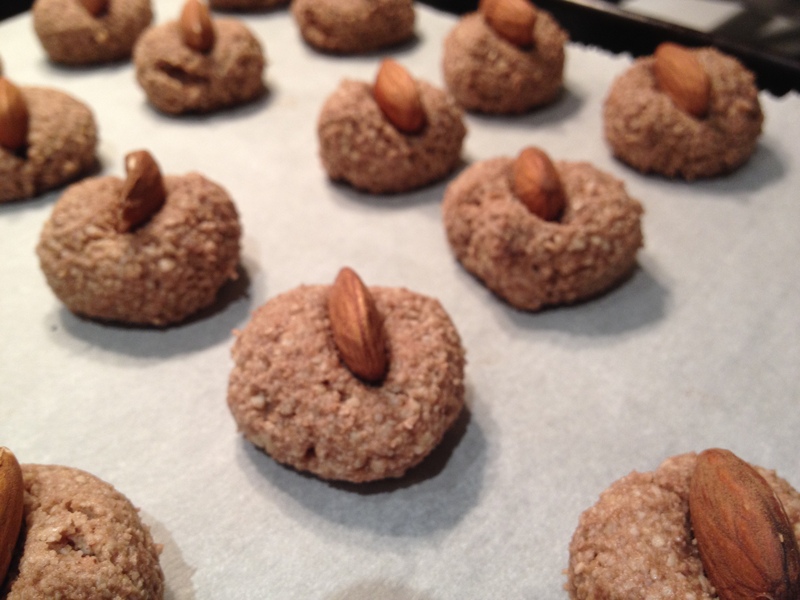 In the recipes created for this blog, we used rice flour, almond meal, ground walnuts, gluten-free rolled oats, buckwheat flour, and the packaged gluten-free baking mix. 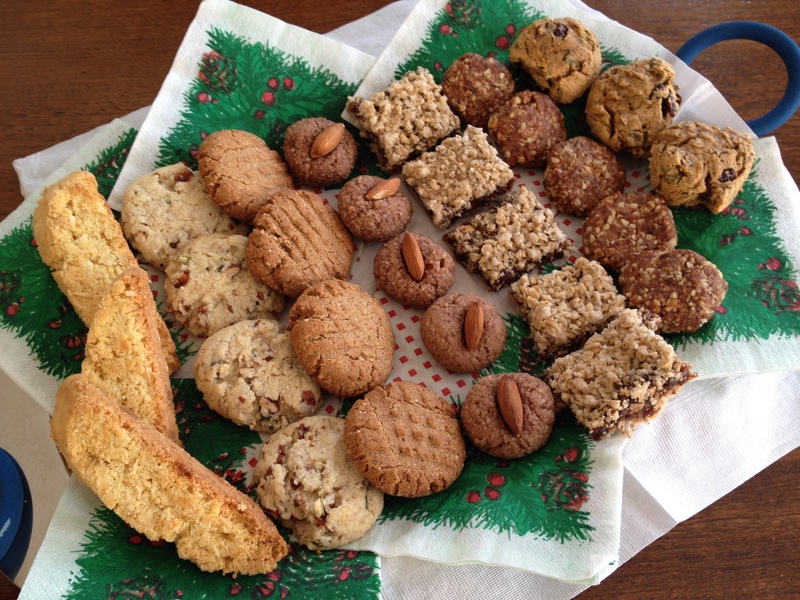 One final word about making Christmas baking healthier: make the cookies or portions smaller! Smaller portions, mean less calories, if you can stop at sampling just one! Most people will appreciate that with a smaller portion, they can enjoy two different types of cookies for about the same number of calories of one larger baked goodie. We tested a few recipes for this year’s Christmas baking. Here are the ones we liked best. 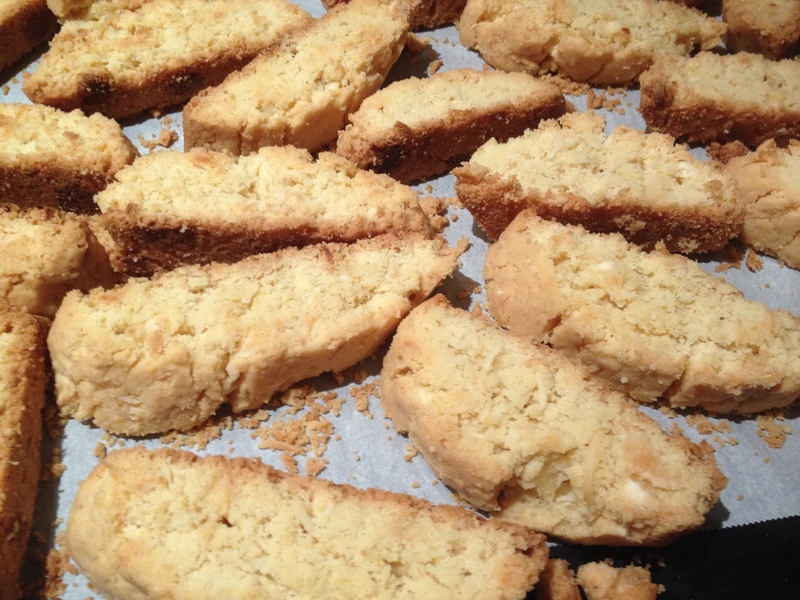 The Amaretti and Biscotti recipes are ones that we re-created from recipes handed down from family or friends. Our recipe of the week is also Mary’s unique creation. The other recipes featured here are from our favorite recipe sites, which we have referenced for you with any modifications we made. The original recipe called for a lot more sugar and some shortening. We used maple sugar and coconut oil in this recipe. We switched up a lot in this recipe. In fact, we had to bake this a couple of times with different ingredients to get it right. 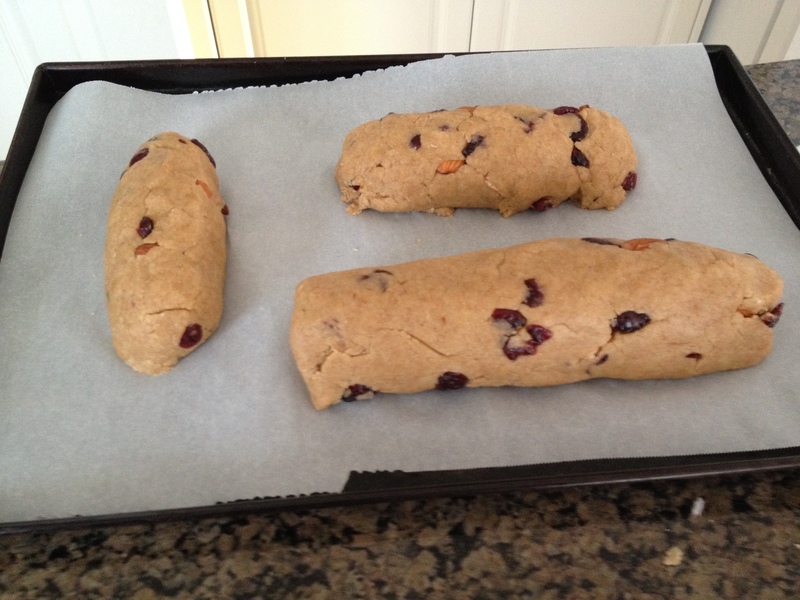 To make it gluten free, we used rice flour and gluten-free baking powder. We also used some extra water to moisten the dough. Mary’s creation this week. These squares were gobbled up just after she took the picture! This is a great recipe that we’ve made before. These cookies are delicious. The only change we made in this recipe was use coconut oil instead of grapeseed oil. The grapeseed oil makes the cookies too oily and moist. 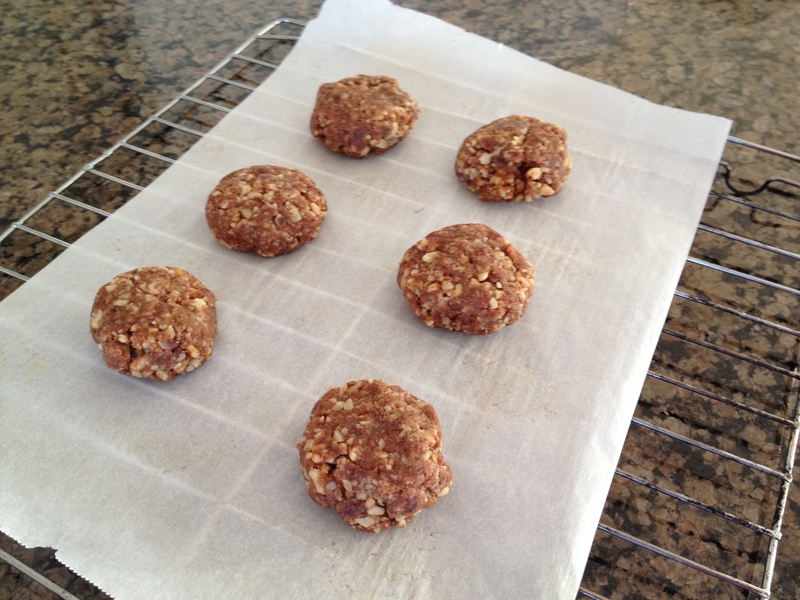 The coconut oil gives the cookies a bit more crumblier texture. Another excellent cookie recipe. We baked it as per the original recipe. Next time, we may try to substitute some coconut oil for the grapeseed oil for this recipe as well. 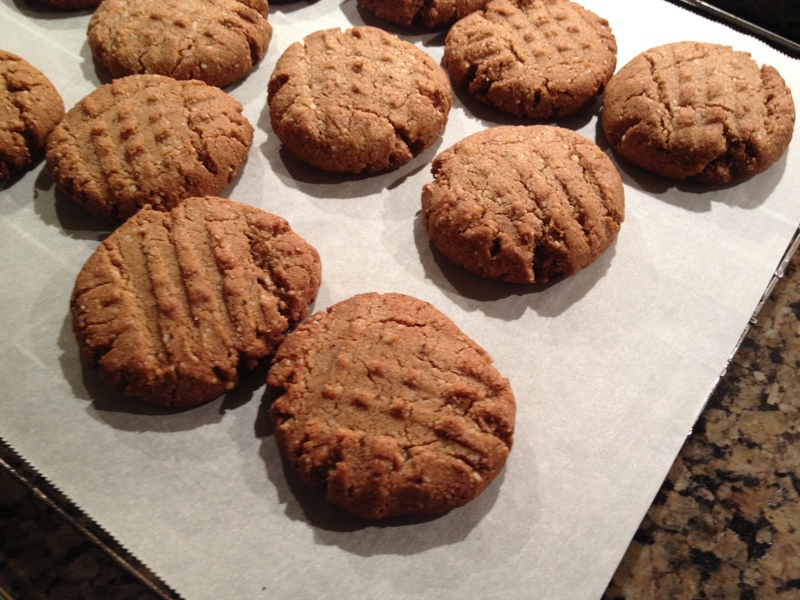 Okay, these are the best healthy ginger snap cookies ever! No changes necessary in this recipe. Thanks to Jules and Ellen of Best Fit Body who created a healthy version to an old time favorite. This is a good recipe. 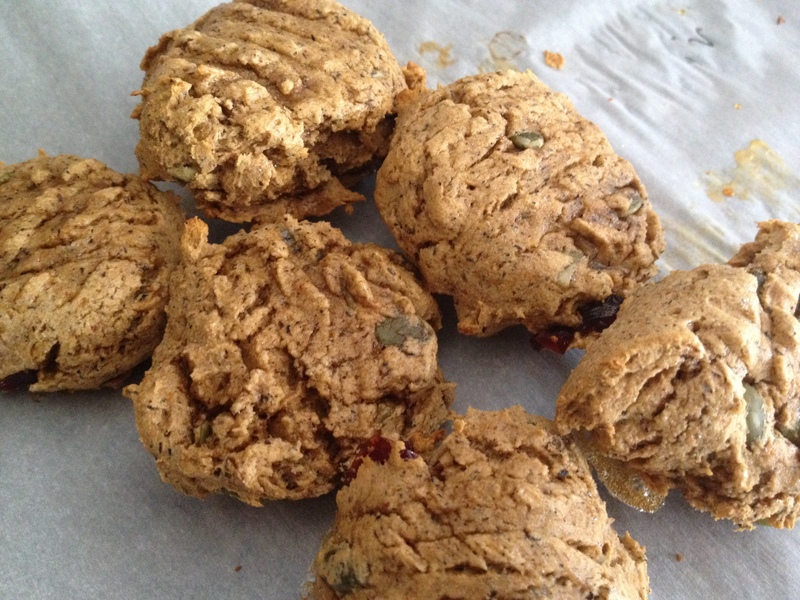 We made it gluten free by using rice flour instead of whole wheat, and gluten-free whole grain oats. We also used coconut oil instead of the butter. The next time we bake this, we may include an extra tablespoon of grapeseed oil or water to help the crumble mixture hold together at the bottom of the pan. This cookie is okay and spongier than we prefer. For this cookie, we substituted the whole wheat flour with the Cloud 9 gluten-free all purpose baking mix. Although the 3/4 cup of honey sounds like too much sweetener, the recipe needs it! You could use a mixture of maple syrup and honey if you prefer or use a mashed banana with 1/2 cup honey. Let us know if you try a different version and how the recipe turned out. Here are some pictures of recipes that didn’t quite work out. We will spare you the recipes and just show the pictures. The first is the soft ginger cookie that tasted not so great. We made a cream cheese pumpkin spread and put it between two cookies. Another option would be to use the cookie as the bottom for a mini cheesecake baked in a muffin tin. Mary is not a big fan of cream cheese but we had to make the 40 cookies edible to our finicky family! 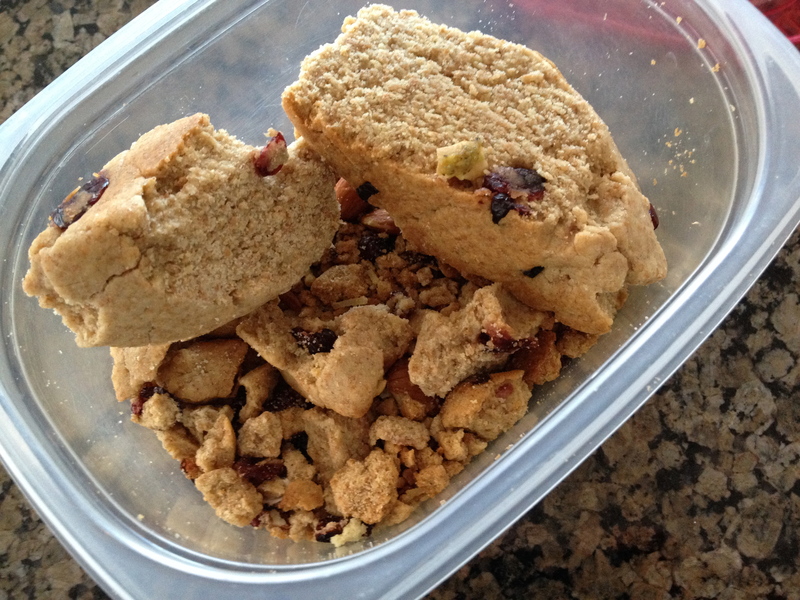 This was the first attempt at the re-invented biscotti. They did not hold together at all! The texture didn’t taste right either since we had used a combination of rice flour and spelt. 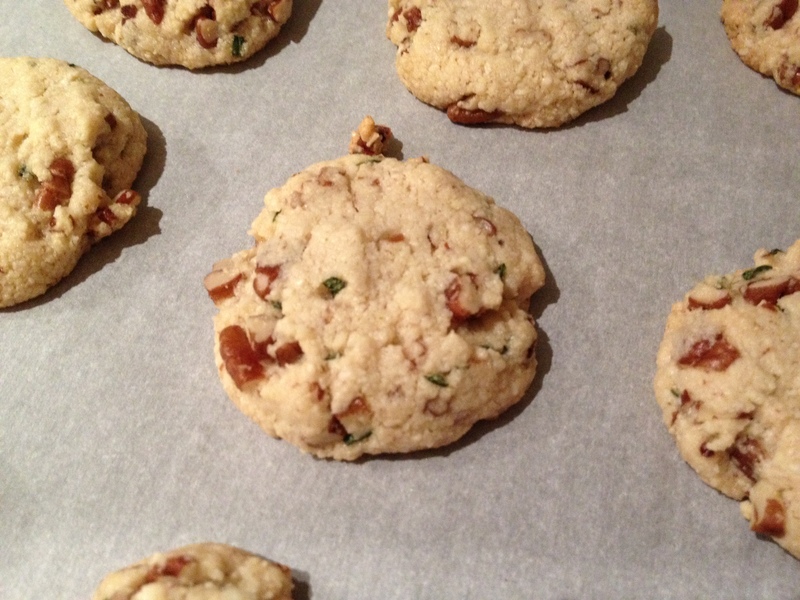 The whole almonds made cutting the cookies much more difficult than soft chocolate chips. So, we just took the little pieces from these cookies and will crumble them over yogurt or just snack on them when we need just a little sweetness without the guilt! What they looked like after baking! 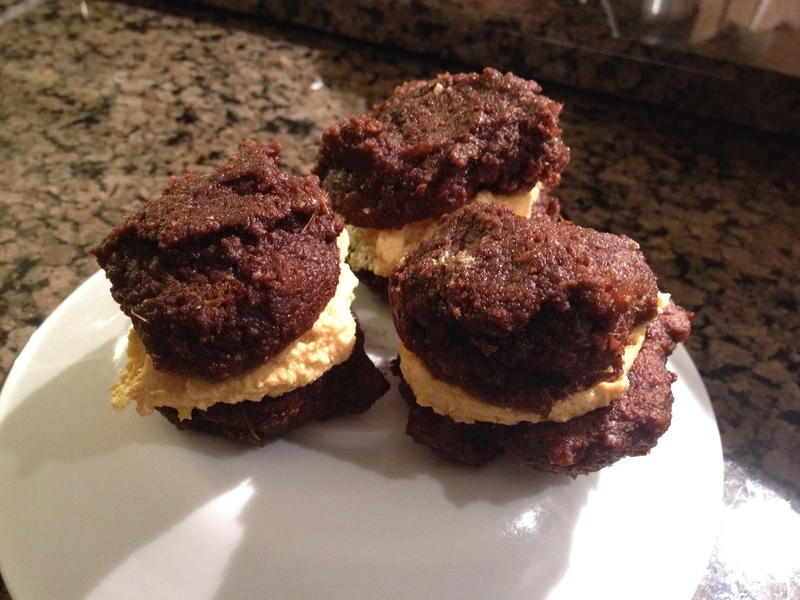 This entry was posted in Recipes, Weekly Blogs. Bookmark the permalink. Thank you, Laura. Glad that Alex is enjoying the treats!